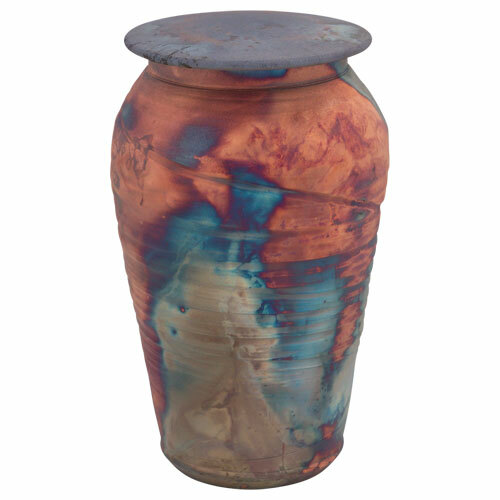 The Blue Copper Fire Raku Ceramic Urn showcases the beauty of raku glazes on a hand-thrown ceramic urn. The copper metallic glaze on each urn is unique and overlays the base glaze in earth tones of blue, green, and gray. 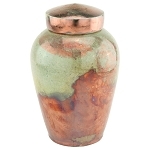 This urn has a natural, almost rustic finish with the metallic accents. 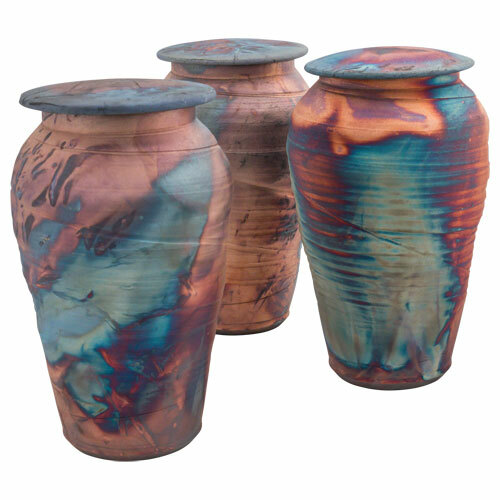 This raku urn is popular with families seeking that unique, artistic statement piece. This urn is made by the ancient art of raku. The artist begins by hand-thowing the piece. Then it is glazed and placed in the kiln. Each individual pottery item is then removed from the kiln while the glaze is still hot and molten and placed in an airtight container filled with straw or leaves. As the container bursts into flames, the glaze produces a unique pattern and color combination. Due to this handcrafted process you can expect to see variations in the color and pattern of glazing. The urn will be similar to the one shown, though not exact. 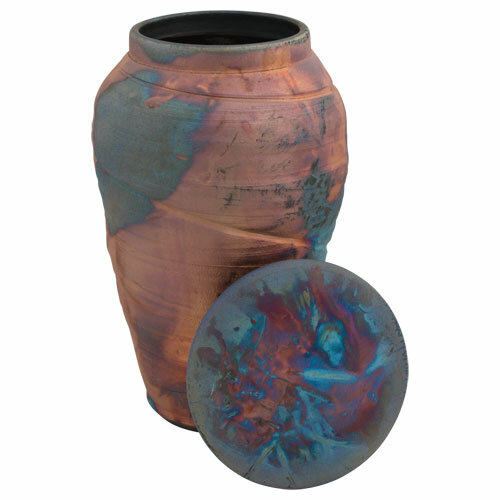 The Blue Copper Fire Raku Ceramic Urn is produced and hand-glazed by an American master potter. Made in the USA. 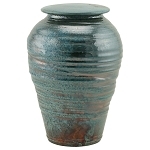 The Blue Copper Fire Raku Ceramic Urn is cylindrical with a fitted top lid in a mixture of blue, copper, and gray colors. The lid can be sealed with an adhesive product like E6000. 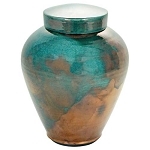 Due to the fact that this urn is hand-crafted, it will vary in appearance from the image displayed. 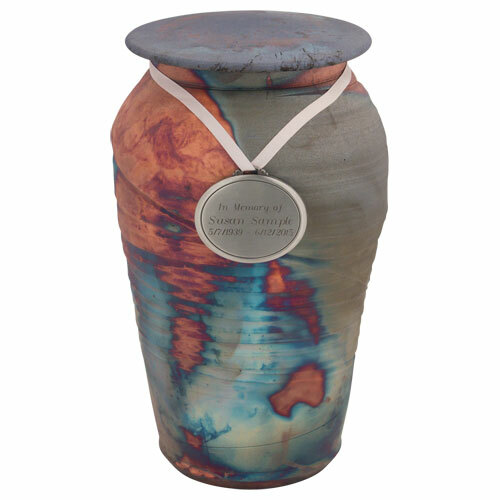 This ceramic urn can be personalized with an urn pendant. 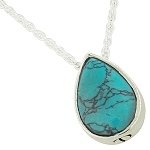 This pendant can be engraved with a personal message, such as a loved one’s name or dates. The oval pendant is presented on a satin ribbon that can be draped around the urn. 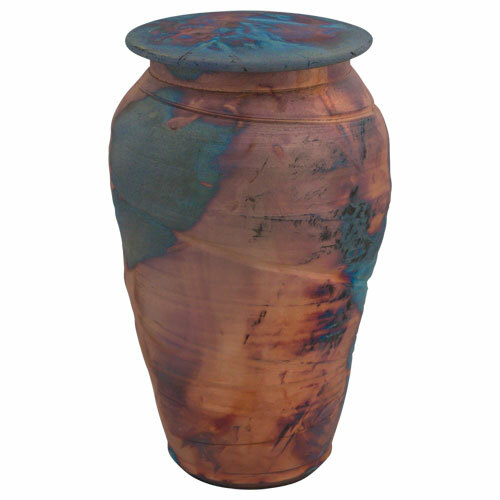 The Blue Copper Fire Raku Ceramic Urn is a hand-thrown artistic urn for ashes that has blue and fiery metallic copper glazes.